My review: We had a wonderful stay at this Casa. 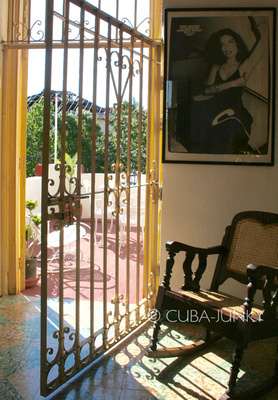 The casa is located in a nice, quit neighborhood in Havana close to the city centre. The host, Jorge, is super friendly and helpful. He can tell you all about Havana and Cuba and will makes sure that your stay is perfect. How was your room? : Big, comfortable. My review: Nunca imagine que quedarse en Casa Blanca haría la diferencia a mi visita a Cuba, pues al visitar otros países me había quedado en Hoteles donde solo llegas a dormir, te bañas y te vas. Sin embargo debido a que Aeromexico extravío mis maletas por varios días, no tenía ni ropa limpia que ponerme. Pero don Jorge (propietario de Casa Blanca) y (Yani) la persona que lo ayuda en la limpieza de la misma, nos tendieron la mano. Desde darnos pasta de dientes, cepillo dental, desodorante, prestarme ropa hasta lavarnos la ropa para el otro día. (cosas que en otro país hubieran sido adquiridas fácilmente, pero en Cuba era difícil). Ese gesto me lleno de mucho agradecimiento. Don Jorge nos escucho, nos ayudo a tomar taxi, nos presto un chip para estar comunicados, nos saco copia de los pasaportes, espero nuestras maletas y nos oriento para conocer lugares. Un servicio completo. Cuando regrese a Cuba sin pensarlo me quedo nuevamente en Casa Blanca. My review: Casa Blanca se encuentra ubicada en uno de los lugares más tranquilos de La Habana, sumado al hecho que está en un lugar de hermosas casas de la burguesía cubana pre revolucionaria que merecen la pena ser admiradas. Por otra parte las habitaciones son simples pero muy pulcras al igual que la ropa de cama, disponen de aire acondicionado y cajilla de seguridad. La persona encargada de la limpieza, Jany, es alguien muy accesible y confiable. Asimismo, el dueño de la casa, Jorge, fue una persona extremadamente amable con nosotros y nos orientó en todo momento. De hecho al llegar a La Habana descubrimos que nuestro equipaje no había llegado con nosotros y él junto Jany no dudaron en prestarnos ropa, cepillos de dientes y anti transpirantes (a sabiendas de los difícil que es encontrarlos) para no pasarla tan mal, algo por lo que estamos totalmente agradecidos y es una muestra de su gran humanidad. La casa se encuentra ubicada cerca de una avenida muy importante para el acceso al casco urbano de La Habana, Cuba. How was your room? : Sencillas pero muy limpias. How was the food they offer? : Ofrece desayunos económicos o bien más elaborados si se desean, que van de los 2 CUC a los 5 CUC. Other services they offer: Te proporciona un chip de CubaCel para poderte comunicar mientras te encuentras en Cuba. My review: Casa Blanca is wonderfully located away from the main tourist activities and noise in Vieja. 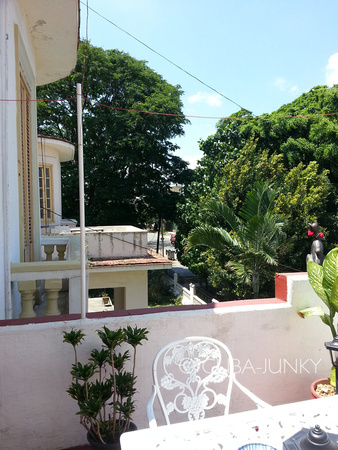 It is on a quite tree lined street in the classic residential area of Vedado. Many of the homes there are being rebuilt or reconstructed to their original classic state. Jorge has lovingly brought his back and maintain it in loving memory of his mother who lived there many years. Jorge is a worldly man having lived in other places and speaks excellent english. He is open and honest in conversation and assures his guests all treated well, going out of his way to make sure we had a memorable vacation. He also helped us tremendously in finding a personal architectural guide and accommodations for the remainder of our trip. Due to unforeseen circumstances Jorge also helped us resolve some difficulties we had and I can now profess that he is one of my trusted friends and I believe the feeling is mutual. Staying with Jorge or Casa Blanca will only enhance your trip to Cuba. How was the food they offer? : Every morning there was plenty of fine breakfast goods. Fresh coffee, Juice, homemade breads and eggs of choice. If you have dietary needs I'm sure Jorge will be able to accommodate. Other services they offer: What ever you need Jorge will try and help. A good friend. Other comments: It can be challenging traveling in Cuba as they are still developing their infrastructure. With Jorge as your support you will learn the ins and outs to navigate this developing country for their benefit and yours. My review:	Je suis allé a la havane pour la premiere fois en Février 2016 pour un séjour de 3 semaines. judicieux.Bref, toujours là pour rendre notre séjour dès plus agréable. Je ne voulais pas etre au coeur de l'action touristique,mais un endroit relax et près des attractions. demeures coloniales ,grand hotels, ambassades, musées restaurants, bars. Other services they offer: Ce que j'ai beaucoup apprécié de cet endroit c'est la belle terrase au deuxième étage. My review: I absolutely LOVED this place! It was so much better than staying at a hotel. The host, Jorge is so friendly and kind to his guests. He answered every question that we had. He is so hard working. It seems like he is continually making improvements to the house! He gave us some great restaurant suggestions and was quick to arrange taxi rides when we needed those. The common areas are so very nice. I loved seeing the antiques. The neighborhood seemed very safe and is very close to John Lennon park. How was your room? : My friend and I stayed in the larger room on the second floor and it was very comfortable. We had plenty of room for all of our luggage and I felt very secure with personal safe in our room. We had use of the large bathroom with a very nice shower. How was the food they offer? 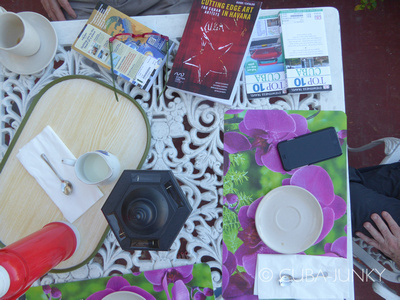 : The breakfast started with wonderful Cuban coffee and hot milk and soon a beautiful bowl of fresh local fruit! This was followed up with scrambled eggs and a Cuban sandwich (I often took this with me to snack on later). Everything in the house was so clean and comfortable. It was amazing! Other comments: I would definitely stay here again. I recommend this casa to all of my friends! My review: Casa Blanca was a great place to stay. I am a 70 year old male from the Midwest in the United States and was on a research trip looking into Scuba Diving in Cuba. I traveled with a friend and scuba buddy. We stayed at Casa Blanca for 6 nights between 6 June and 13 June. The Greeting and Hospitality we received at Casa Blanca could not have been better. I am recommending Casa Blanca to all my friends and hope to stay there again myself. How was your room? : Our room was lovely, filled with beautiful antique furniture. It was kept spotlessly clean. It had a nice air conditioner, necessary for a restful nights sleep. How was the food they offer? : The breakfast was very nice with a large helping of fruit and an egg dish and a pastry. Other services they offer: Jorge, the owner was always ready to answer our queries and offer informative recommendations. He made our touring the city so much easier. My review: We spent several nights in the Casa and had a wonderful stay. The Casa is a beautiful two store villa with a small but excellent garden. It took me back to my childhood. Jorge is a very welcoming and a polite host a "MENSENMENS" who provided us with a map pointing out all great places. Ask him anything and he will tell everything. How was your room? : excellent room with good beds, airco and a fan. Both were needed because it sure was hot at that time. How was the food they offer? : We only took breakfast but is was great. Good coffee, lost of fruitsalade and juices. Every day eggs, a backed bunn with ham and cheese, and some dessert cookies. Other services they offer: Quiteness, relax on the terras. My review: I have traveled to Cuba many times the past 5 years to work,have always tried to stay at this casa particular. I have stayed at 5 star hotels when necessary,but they do not compare. Jorge Duany and I have become good friends over these years. There is simply nothing to complain about; the rooms,have stayed in all the different rooms, the staff, and especially the personal service. Currently have reservations for 2 weeks this coming November and December, 2016. My review:	We really had a great stay at Jorge his place. It is a colonial house with terras and nice rooms. Jorge is a great and friendly host. He will inform you about how thinks work in Havana and give you good tips. Great breakfast. The house is in a residential area which feels very save and it is nice to be amongst the Cubans. Our daughter and a friend of hers stayed there as well. My daughter got sick and Jorge helped her through this difficult days and informed us as well. He took her to the hospital, arranged a tour by car and the taxi to the airport back. So an amazing experience and if you are looking for a great and familiar place to stay, we can definitely recommend Casa Blanca! How was your room? : We had a nice room with airco (although we only realized after two nights...). Next to it a small room and terrace on the first floor. Other services they offer: Jorge is very helpful. If there is anything you want to know or to arrange he will take care of it. Even for our daughter who wasn't visiting his casa at first, he arranged a taxi pick up from the airport to the Viazul busstation. Other comments: We definitely recommend Casa Blanca!! 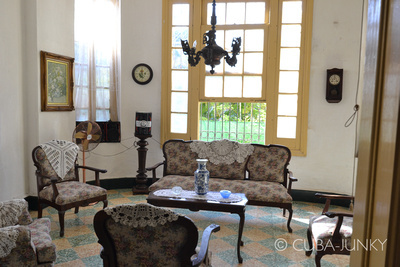 My review:	My stay at Casa Blanca is one of the reasons why I will return to Cuba. Jorge could not have been a better host -- his goal was to make us feel at home..something he did very well! The atmosphere was relaxed but also elegant with it's artwork, decor and beautiful antiques. The neighborhood was quiet and safe and a short taxi ride to Old Havana. When we arrived it was close to 10pm and were a bit hungry. Jorge accompanied us to get a bite and then we walked to El Malecon where we were serenaded by a couple of guys with a guitar and maracas..a night I will always remember with a smile! How was your room? : Extremely pleasant, very clean and spacious. How was the food they offer? : Excellent and a lot of it! Other services they offer: All around hospitality. Jorge's suggestions were always spot on. Other comments: This was the first time I returned to Cuba since leaving 55 yrs ago. Obviously was very emotional, full of contrasts and impressions to process a lifetime. The generous spirit of the people made me and also my friends (not Cubans) feel very welcomed. Our stay in Casa Blanca magnified that feeling. I will always be grateful to Jorge for helping me feel I was home again! My review: We loved staying at Casa Blanca. The house was comfortable and the host was helpful. We always felt safe and Jorge helped answer many of our questions. When we go back to visit Cuba, we will stay again at Casa Blanca. We were able to discover the wonderful neighborhood, take a quick taxi to the old town and walk to restaurants each night. I would recommend staying here! How was your room? : Our room was vintage Cuba. The room was spacious and when the weather was hot, the fan cooled the room to a perfect temperature. Each morning we sat on the upstair balcony enjoying the sounds of the neighborhood...birds included. How was the food they offer? : We were given a delicious breakfast each morning. We couldn't have asked for more, it was great. Other services they offer: Jorge was a wealth of information. Whenever we needed anything, Jorge was there to help. When we needed answers, Jorge was there to help. If we needed a cab, Jorge would call. If we needed a place to eat, Jorge gave us suggestions. We were looking for artist studios and Jorge would help us make the calls and help us with directions. Other comments: We can't wait to visit again and call Jorge our friend. My review:	Casablanca is more than a place to stay, it feels like home to us. Jorge, the owner, takes the utmost care in helping each client with what the need around the city. He gives good, honest recommendations. It's great service. The 1920's mansion is meticulously restored and tucked away in the quiet upscale neighborhood of Vedado. The antiques and lush plants all add to the welcoming atmosphere. You can take taxi collectivas just a couple blocks from this casa particular and get to Habana Vieja for about .50 cents each way! We love it and it's our go to place each time we visit Havana. How was your room? : The room is air conditioned, has a private bathroom and 120 Volt electricity. Always clean and organized. How was the food they offer? : The breakfast is the best! Fresh squeezed juice, eggs, ham & cheese, pastries, fruit.... it's a wonderful way to start the day. My review: We were treated very cordially and given all the direction and support like family members. No question went unanswered, the advice was 'spot-on' and the breakfast was consistently tasty and nourishing, maybe, better than I make at home. Automobiles were arranged for everything on time and with my budget and a map guided us around the City. The rooms are spacious and comfortable. I will be staying here again in 2017 and I will stay longer. How was your room? : Spacious and comfortable. How was the food they offer? : Excellent, better than i prepare for myself. Other services they offer: Excellent advice about walking and riding around the City of Havana. Other comments: We feel so lucky to have found this place and the guidance of Jorge was very comforting and useful to enjoy our visits around the City. My review:	We spent three nights in Casa Blanca in march/april 2016 and had a wonderful stay! The Casa is a beautiful two story villa in a small but lush garden. It is has a very homely feeling with old furniture and whimsical and personal decorating details. Jorge is a very welcoming and polite host. He provided us with a map, pointing out all necessities, sights and some great paladares. He gladly helped us arranging taxi rides, gave us great information before our trip to Playa del Este and was always available to us when we had questions. Visiting Vedado was one of the highlights of our trip to Cuba. We especially enjoyed walking the streets (most of them lined with old trees that provide shade) and taking in all the amazing architecture. It feels like every house in Vedado is different from the next and that they each have a story to tell. There are som great museums to visit, and a huge cemetary. Ask Jorge and he will tell you! Compared to other parts of Havana, there are not that many tourists around Vedado. The citizens we met were really nice and helpful with giving us directions and tips. How was your room? : Our room, on the second floor, was very clean and spacious. The room was beautifully decorated with old furniture and had a very high ceiling. There were three tall windows facing the garden and street. There was a free standing fan, easy to move and ajust. The bed was comfortable. The air conditioning was very effective, yet noisy. We had access to the second floor balcony, which was a great place to sit and relax in the evening. How was the food they offer? : The casa offers a nice breakfast for an additional 5 CUC per day. The plentiful breakfast included coffee, juice, a grilled sandwich with cheese and chicken sausage, scrambled eggs, a big bowl of fresh fruit salad, crackers with butter and marmalade and also a small dessert like a piece of cake. There was milk, two kinds of sugar and honey. Breakfast was served in the lovely dining room at a large table that we we shared with the other guests. We especially liked the fruit salad! Other services they offer: Beverages, valuable tourist information, Taxi reservation. Other comments: Booking this Casa particular was really easy. Jorge is quick to reply to e-mails and is very informative so that you feel well taken care of even before the trip starts. Thank you Jorge for your hospitality! My review:	My family and I visited Cuba and stayed at Casa Blance 917 during the time we were in Havana. Even before we flew to Cuba we were in touch with Jorge via e-mail, to which he always replied promptly. 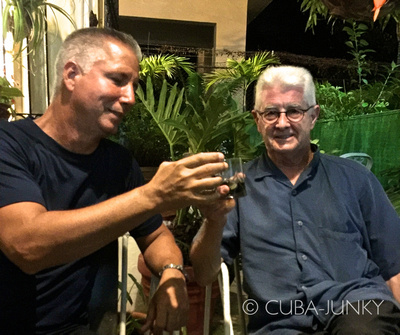 Jorge advised us on how to best spend our time in Cuba, what to see and do, and gave us excellent restaurant/bar recommendations. He went above and beyond by helping us arrange rooms at Casa Particulares in other cities we were staying. Jorge made us feel right at home in his beautiful house. We woke up to a gorgeous breakfast. It's only a short walk to the main road and Malecon, and a short taxi ride in a classic car to Old Havana. We will definitely stay at Casa Blanca again the next time we visit Cuba! How was your room? : Large, spacious, and clean. How was the food they offer? : The breakfast was delicious and plentiful. Other services they offer: Jorge went above and beyond. He helped us where ever he could- arranging taxi pick ups to and from the airport as well as any other location, organizing Casa Particulares for us in other cities we were visiting, recommending excellent restauarants / bars within walking distance of the house. My review: A friend and I recently travelled to Havana. Even before we left The Netherlands, we were well taken care of by Jorge, our host at Casa Blanca 917. Jorge went out of his way to help us organize a taxi for our transit to Vedado where this beautiful Casa Particular is located. Jorge was there to greet us and help us settle in to two very comfortable rooms on the top floor of his classic 1920s Cuban home. The environment at Casa Blanca 917 is restful. Be prepared to slow down and totally relax! You'll start your day with fresh fruits and delicious coffee in the morning, and Jorge will help you plan your day with his tips and suggestions to get the most out of your visit. He is passionate about his country and wants you to experience and explore as much as possible. 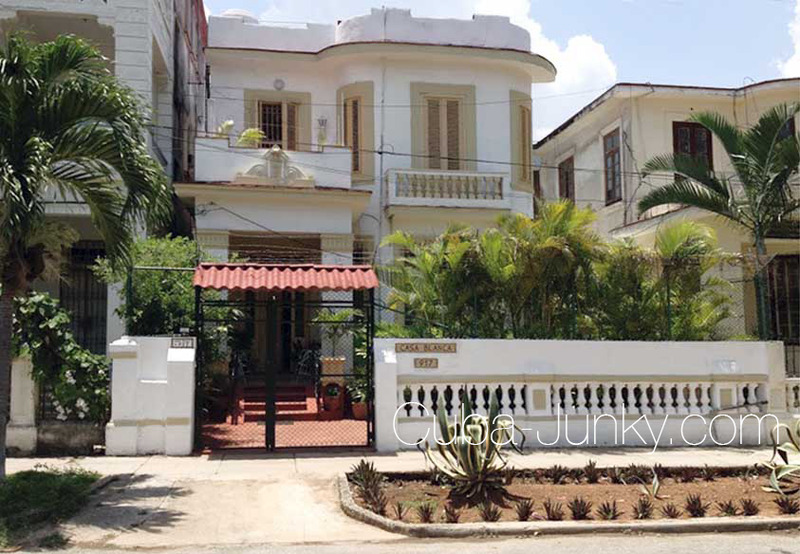 The Vedado neighbourhood in which Casa Blanca 917 is located is a feast for the eyes. We got out and walked as much as possible and made it a point to take a different route to and from, each time. There are so many interesting and picturesque historical homes in this charming area. Jorge has great recommendations for restaurants in Havana; make sure you stop by Nardos for an authentic Cuban meal. And while in Vedado, Doña Juana and Vampirito will be two of your favourites. We were repeat customers at both! A stone's throw away is Café Madrigal which is a fabulous spot for drinks and live music in the evening. Back at Casa Blanca 917 you can wind down from your day of wandering. Have a seat in the private garden, or up on the balcony taking in views of the neighbourhood. From start to finish a vacation in Cuba is memorable. It can be made even more special if you stay at Casa Blanca 917 under the care of Jorge and his staff. Jorge will make you feel so welcome, by the end of the week, you won't want to leave! I highly recommend Casa Blanca 917. Location, service, friendliness, comfort are all five star! How was your room? :	Quiet, comfortable, spacious. Other services they offer: Jorge goes above and beyond to help with tips on where to visit and explore - restaurants, bars, sights. He's the best host! 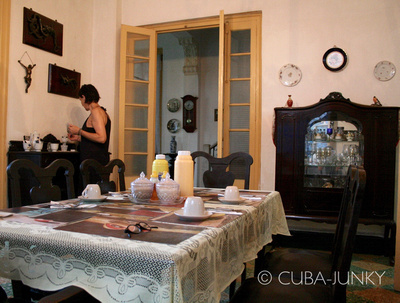 My review: Superb hospitality in a pleasant, quiet and fully restored Havana Mansion! 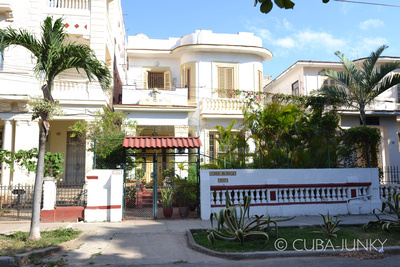 I visited Havana recently and stayed with Jorge in his delightful Spanish style villa called Casa Blanca 917 in Vedado. It came recommended by previous reviewers on TripAdvisor who had all ranked it as excellent. They were right, I was made to feel at home and looked after for 6 days by Jorge and his friendly staff. I would not hesitate to stay there again on a return visit to Cuba. Jorge speaks excellent English and is very knowledgeable on all aspects of Havana and life in Cuba. During my visit he kindly arranged an overnight night stay in a Casa in Trinidad .His one aim is to ensure his guests have the best possible stay in Havana. The house is tastefully furnished with interesting antiques and is in top class condition. The breakfasts exceeded my expectations with fresh fruit every morning and lots to eat. My apartment was self-contained with a good bathroom and all the facilities I needed. It was clean, quiet and importantly I felt very safe. This area of Vedado is a pleasant residential area of Havana with many beautiful old mansions, interesting local restaurants ,bars and facilities. From Vedado it is easy to get into Old Havana by cheap taxi or a 30 minute interesting walk. This Casa is a home from home and I have no hesitation in recommending it to prospective guests. Other services they offer: Advice on all Cuba Havana subjects-Invaluable!! 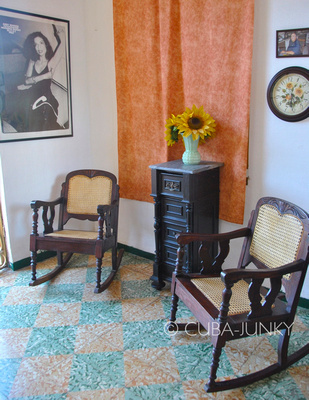 My review: The Casa Blanca 1920 is in a quite area of Cuba, with good accommodation and services. In the entrance is another place to sit and talk to other guests or Jorge the owner, or Elisabeth the care taker. And both do take care of you as guest. Jorge arranged for the taxi from the airport to the casa which is a 30~45 minutes drive, but also arrange payment for the taxi as I had no pesos at that moment. Later he suggested a nearby restaurant which we where allowed to pay later since we have not changed money. How was your room? : We stayed in the room facing the street which does not have an in-room bathroom, but across the corridor at 2 meters from the room door we had a private spacious bath room with everything in and on it. A balcony adjacent to our room was a great place to relax and read. How was the food they offer? : A lunch was served for use with a traditional dish and drinks and desert by Elisabeth. Great tasty and well served. It truly was a surprise for us. Further, drinks can be asked for, nearby shops at 10 minutes supply the needful. Other services they offer: In the entrance is another place to sit have a drink and talk to other guests or Jorge the owner, or Elisabeth the care taker. And both do take care of you as guest! Jorge arranged for the taxi from the airport to the casa which is a 30~45 minutes drive, but also arranged payment for the taxi as I had no pesos at that moment. Later he suggested a nearby restaurant which we where allowed to pay later since we have not changed money. What a service. When we came back unexpected at a later date there was no vacancy but Jorge guided us to a nearby other Casa and stayed with us until the english speaking owner arrived. Other comments:	Within a 20 minutes nice walk you reach the Malceon at a point where a few Hotels and shops are situated. In the largest hotel you'll find a Cadenca to change money but also along the "Linea" (A street you cross) are plenty Cash machines that accept european credit cards. Our experience was that the cost for getting money from the machines varies between 6 ~ 8 euro's only for 100 Cuc at an exchange rate of nearly .95 to the euro. Also on Linea you'll find normal restaurants and snackbars, but for the nicer eateries you'll ask Jorge.. he knows a few very nice once. My review:	This was a great house, very charming and clean. The bed was very comfortable, the room was spacious. I especially liked the balcony. This is definitely the best breakfast I have had in Cuba. Also the host Jorge was very nice and gave us some advice about things to do in Havana. We really liked the place and will definitely stay here again!